Have you been too reliant on email marketing? Post-GDPR we have seen lists cut by as much as 90% and the reach of your email lists diminish dramatically. There is a way to refocus your marketing efforts through more traditional methods like direct mail. Are you sending likely consumers or existing customers direct mail? If the answer is no, then you are missing out! In recent years many businesses have devoted their time and efforts to digital marketing strategies. Many have abandoned traditional methods of marketing. Digital marketing is cost-effective, can reach a larger audience and you are able to track and analyse your results. Businesses have found this very beneficial. The rise in the use of social media, however, has had a negative impact on consumers. 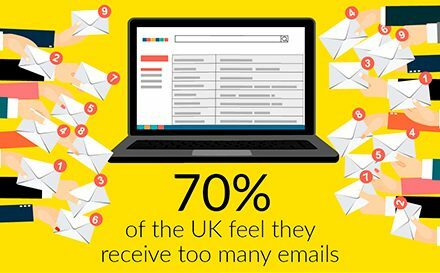 Today, research has shown that 70% of customers feel as though they receive too many emails. As businesses increase their email marketing strategies we end up receiving hundreds of emails. This results in us having less tolerance towards email marketing. A study by Xerox shows that an individual receives 100 emails per week on average and 16 direct mail per week. In addition to this, the Royal Mail explains that 51% of emails are deleted within two seconds. In contrast, 56% of consumers say direct mail grabs their attention. These statistics show that there is a great opportunity to market your business through direct mail. One of the main strengths and reasons that has contributed to the heavy use of online marketing is the power of targeted marketing. The same can be used for direct mail marketing. Marketers can mail to specific consumers to create unique and effective, experiences between the customer and the brand. The use of personalisation has been proven to increase response rates. To further increase the experience, any direct mail you are sending could have a call to action for the consumer to explore online. Inviting the consumer to continue interacting with the brand directly and digitally. The new GDPR law has also affected the way businesses market themselves. With the new law in place, companies can no longer send content to users who haven’t opted in to receive their email marketing. This means that many businesses are losing a significant portion of their marketing list, sometimes up to 90%. Direct mail can be sent to customers if you are able to prove that it is a legitimate interest. Here are 3 good reasons why you should implement direct mail into your marketing strategy. Marketing your brand on multiple platforms is a great way to reach out to existing and potential customers. Individuals who see your brand over and over again; whether just the logo or an advert, are more likely to buy into it. As it is recognisable. Research from Millward Brown has confirmed that, when a person is exposed to content from a range of digital platforms and paper communication, the brand being portrayed through print is more highly-valued in comparison to those who only market digitally. With the enormous amounts of emails being sent out each day, it is extremely easy for yours to become lost in your customers cluttered inbox. With direct mail, you are able to capture your consumers’ attention with physical content. This will have a more beneficial effect as you are giving yourself the opportunity to literally get into your consumers’ hands. Physical mail is also more likely to be left around. It can be picked up multiple times as opposed to an email which may not even be opened. Printed communication can be used to present yourself as a trustworthy brand and to drive loyalty. Sending out direct mail allows your clients to feel a sense of seriousness and legitimacy towards your brand. 55% of the people feel that receiving mail gives them a better impression of the company. Both email marketing and direct mail are beneficial aspects towards great marketing. It would seem that email marketing is more effective for generating profit quickly. Direct mail is better for generating and grabbing the attention of customers. Direct mail and email work better in support of each other. With the implementation of recent GDPR legislation, businesses who have previously relied heavily on email marketing should consider putting direct mail marketing into their marketing mix.